Belvedere Guesthouse and Self Catering, where the old traditions of warmth and hospitality thrive side by side with all the flair and luxury of modern day living. Ideally situated in the Centurion district, this country estate is less than 20 min drive from Johannesburg International Airport, and within easy reach of Midrand, Olifantsfontein, Johanesburg and Pretoria. Individually decorated rooms open onto a large patio ensuring free movement to all guests at the B&B, while the Self Catering apartments are fully furnished living units with private braai areas and gardens. Your hosts Deon and Louise ensure service excellence, catering to a wide range of clients and occasions with an unmatched ability to make you feel at home. In every respect, Belvedere captures authentic country hospitality through personal attention from the Van Tonder family. 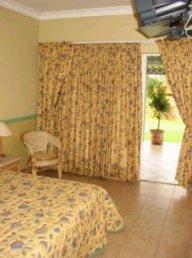 Accommodates 1-2 persons, plus doublebed sleepercouch in lounge for additional people.